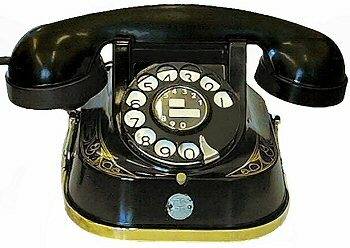 Our range of original Bell Telephones have been restored to full working order, and represent excellent value for money. These original metal bodied phones from the late 1940s-1950s with bakelite handsets were made by Bell in Antwerp and widely exported. What distinguishes the telephones is the fine gold inlay pattern on the top of the phone body. These phones will work in virtually every country and, in many cases - if you let us know beforehand - we can make sure the telephone is delivered with the correct plug for your telephone network. All telephones have a 12 month guarantee. We also offer the wall version of this telephone. Classic 1950s telephone produced in Antwerp, Belgium by Bell, and exported to many European countries and has therefore become a well-known classic telephone. 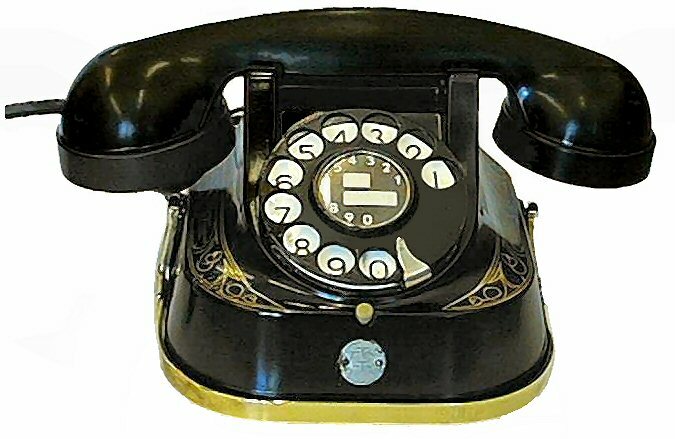 One of our best-selling telephones phones, especially suited to fit into a period setting.